It’s cooling down here in Minnesota, snow forecasted this weekend even though we topped at 80 degrees last week. The sticky, long, dog days of summer dredged deep into to September, and now in October the nights and early mornings bring a chill. And the trees . . . The trees know winter is coming. They’re preparing for it from the inside out. I’m not quite sure how to process this knowledge that the trees have, but it feels important, kind of enormous. The trees flourish and reveal their truest selves even (mostly?) as they’re dying. God has built Truth and theology into the leaves, and I want to sit at their roots and learn from them. How do they know when to drop their guard of green and give into the process of dying to themselves? Why do they trust the timing, each and every year? Do they lean into it, or do they fight back, stubborn in giving into the inevitable blaze of color? The weather only reflects a gradual change. It’s cool, the breezes still, but deep down at their roots, the trees know major change is coming. 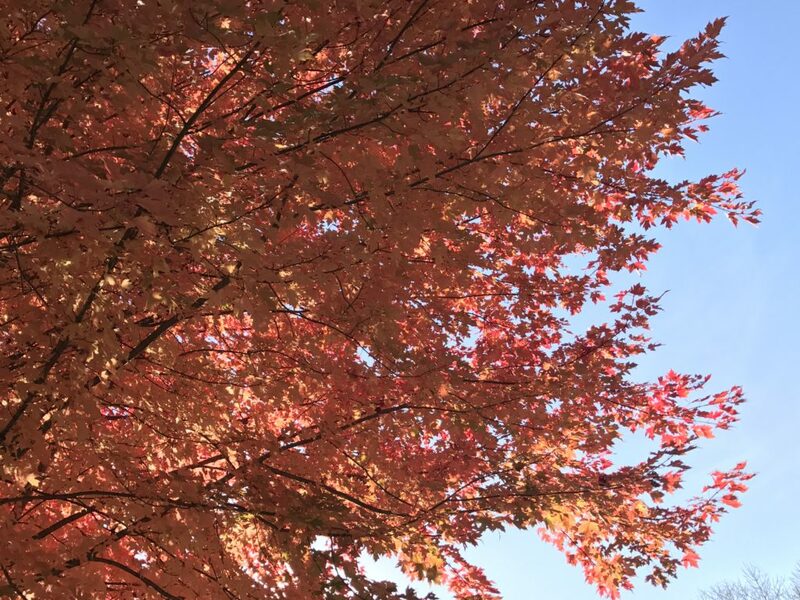 They know they are to be robing themselves in color, preparing for a brand-new season of beauty – yet some remain green. Are they the ones fighting back, against what they truly are deep inside? Sounds senseless, to fight for remaining faded and tired instead of bursting gold and red and orange. Casting off the wilted end-of-summer green. Embracing what is deep down in the core, the beauty He’s placed there to reveal in His time. Maybe in the middle of my own everyday mess, mixed right into the frustration and feelings of being dried up and struggling to keep above water, He’s preparing me for something. Maybe He wants me to choose to take hold, to dig deeper, to look beyond the mess and frustration. To reflect with unquestionable certainty the glory hidden in my heart because of where He chose to take up residence. I’m tired of fighting back. I want to yield to Living color, the kind that only shines when dying to self came first. 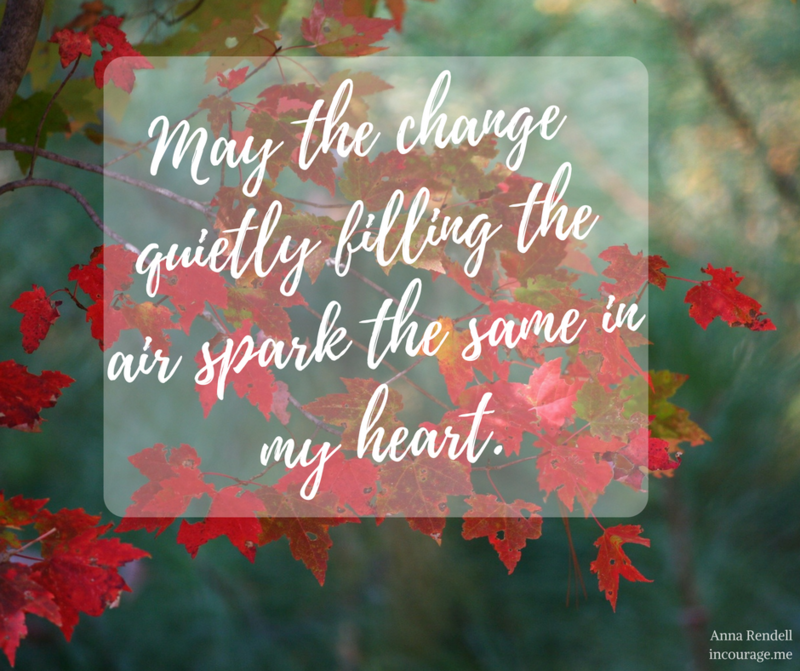 May the change quietly filling the air spark the same in my heart. May I allow it to wash over my life, bolding and brightening each nook and cranny, sweeping the corners clean of staleness. May the cool breath of air fill my lungs as I breath in His grace, breathing out the old and allowing the new to take over. May we learn, embrace, marvel at what the trees know. Thanks so much, dear Kristin.